If your feet hurt often but you can’t find the time for a spa, there is a solution for you. You can get foot massagers that are designed to produce the same effects that you get from professional spas. You can also use foot massage machine to treat yourself without having to spend massive amounts of money. This is one of the best foot massagers because it will provide the same soothing effect as a professional Shiatsu session. It has adjustable heat options so you can choose how hot you want the device to be during the session. In addition, this massager provides a kneading option so you can pick from five different pressure settings. 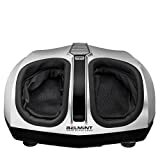 You can use the Belmint Foot Massager after a long day of work to relax and calm down. It will relieve chronic pain, muscle tension, plantar fasciitis and other kinds of foot discomfort. Instead of having to spend money in a spa, you can use this massage machine to unwind while you watch TV or read a book. The Miko Foot Massager also makes it to the list of best foot massagers for many reasons. Firstly, this massager will give a Shiatsu massage to the bottom as well as the sides of your feet for maximum relief. Secondly, it has a deep-kneading system to ensure proper massage that relieves muscle tension after a long day of work. In addition, you can also choose the strength and type of massage which gives you more control over the type of massage that you want. It is an ultra-portable device that you can also carry during travelling and business trips. Another massager that needs to be featured on best foot massagers list is the Homedics Foot Massager. It has a deep-kneading shiatsu massage system that will relax your soles and feet. This machine also has a triple rotational head which maximizes the strength of the massage, relieving you from aching feet. Plus, it has large platform design to accommodate larger feet and can be used by seniors too. Another great thing about the Homedics Foot Massager is that it has toe-touch control so you don’t have to bend to change settings during the massage at all. You can sit back and enjoy as the device massages your foot. This is also a best foot massage machine that has several special features. The MARNUR Foot Massager has counter rotating massage action that provides an optimum amount of comforting kneading. It is also a timer massager that will turn off after 15 minutes on its own so even if you fall asleep during that time, there is no need to worry about it. It will fit feet of up to US size 10 allowing more people to be able to use this massager. Moreover, the deep-kneading massage is useful for anyone who is tired after a long day and needs a break. You can unwind and release foot pain with help of this Shiatsu massage machine. The Beaurer Foot Massager is another one of the best foot massagers with many favorable qualities. 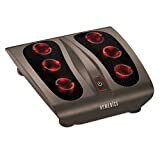 To start off this model comes with 18 rotating massage nodules to relieve aching feet. 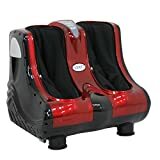 This Shiatsu foot massage machine is a great replacement for spa massages that cost money as well as time. You can use this massager instead which has different speed settings that will sooth muscles and nerve tension after a long day at work. It also features a built-in heat function that increases the efficiency of this massager and helps you feel better. 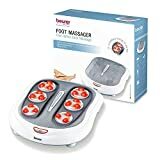 The Beurer Foot Massager also has adjustable feet option so you are comfortable during the time period of the massage. This massager can also be rated as a best foot massage machine. The Naipo Foot Massager features a deep kneading shiatsu massage with multiple heat settings, air compression pressure and vibration. It is specifically designed to mimic the hand movements of shiatsu massagers at spas for deep-kneading system. Plus, the built-in heating will add to the relaxing effects of the massage so you can get ultimate relief from it. This massager will come in handy every time you feel like you need some time to relax and treat yourself. 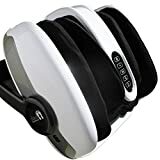 This foot massager is listed in the best foot massagers list because it combines a number of things that will relieve your foot pain. It has acupressure, heat, hydrotherapy and shiatsu that will give you the complete spa experience and comfort your muscles. This massager will relieve your soles and foot sides that will heighten the effect of the massage. The device also has two built-in motorized rollers which will specially focus on heels and balls of the feet. Moreover, since it has hydrotherapy mode you can use essential oils or salts to enhance the soothing effect. You can choose the temperature so the heat is according to your preference. 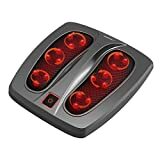 This massager is a best foot massage machine since it has dual massage features. The CloudMassage Foot Massager will relieve your feet as well as your calves after a long and stressful day. It has a 90 degree angle so you feel more comfortable with your feet in the massager. You can choose the air compression pressure and vibration level on this massager so it will be suitable to your needs. Whether you want it to unwind, treat neuropathy or diabetes, this will be a useful instrument for the feet. It will increase and improve blood circulation levels and help with overall health too. 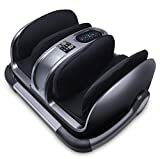 Another impressive addition to the list of the best foot massagers is the Brookstone Foot Massager. It has deep kneading foot massagers for the ideal shiatsu massage at home. There are also three modes to pick from: soothe, pulse and energize. You can also choose the level of heat during the massage for your own comfort. This massager will help you wind down after hard day, travelling or other activities. It will also be useful for people with chronic foot pain. Moreover, it will significantly improve blood circulation while promoting your well-being. 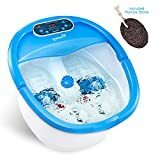 If you cannot find the time to hit the spa, you can get the same relaxing massage at home with this foot massage machine. Lastly, ZENY Foot Massager is yet another great massager to be picked out for the best foot massagers. This foot massager is useful to calm feet as well as calves. You can also control the settings for foot and calf massage through the buttons. This massager can be used by anyone who cannot find the time for a professional shiatsu massage. The ZENY Foot massage machine will give you soothing massage to relive all tension from the body. The deep-kneading massager will also make sure that you get maximum comfort and effect of the massage that relieves all the tension of the day. All of these are the best foot massagers that will help you take the edge off after a long day. If you spend a lot of your time having to move around, you will definitely like these useful massagers with multiple options and settings that suit you.